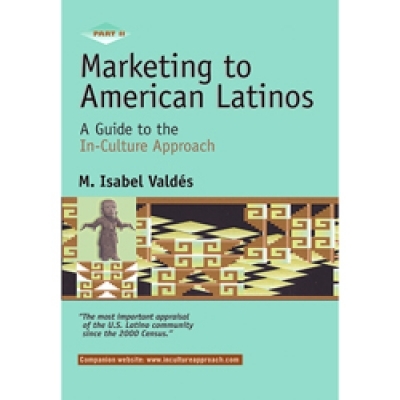 "Marketing to American Latinos Part 2 by Isabel Valdes"
Hispanic marketing means marketing "in-culture," and no one understands it better than Isabel Valdes, a researcher and writer with years of experience in this important market segment. 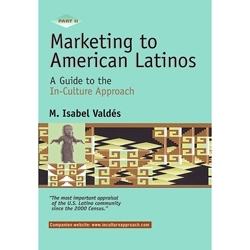 Marketing to American Latinos, Part II picks up where Part I left off to provide practical information for Hispanic marketing. Ms. Valdes uses data from the ACNielsen Homescan Hispanic panel to analyze spending patterns of Hispanics as they move from Spanish-preferred to English-preferred in the acculturation process. Marketing to American Latinos analyzes the "what and where" of Hispanic spending on many products and services. In sharing four different ways of segmenting the Hispanic market, Ms. Valdes notes that companies may need to use one or more of these Hispanic market segmentations in order to properly target the appropriate segments of the Hispanic market. Included are new case studies from a variety of industries who have successfully targeted the Hispanic market, a list of the 100 best websites for targeting Hispanics, and a formula for creating an integrated marketing strategy for the Hispanic market.